Planet of Slums by Mike Davis (2006) is a startling, terrifying, and honest exposé of the world’s poorest big-city slum dwellers. The book explores the future of an unstable and impoverished urban world, and provides a thematic overview of the rise of slums and urban poverty in the Global South. The book delves into the factors accelerating the rate of global slum growth and examines historical and modern processes such as colonialism, pirate urbanism, slum-removal and other various state-related legacies that actively contribute to increasing urban poverty. Planet of Slums by Mike Davis (2006). Although perhaps overly pessimistic, the book is nevertheless a comprehensive and breathtaking read, clearly conveying its underlying message that slumdom is the result of systems of self-interest and ‘First World’ selfishness linked to economic adjustment policies, globalization, capitalism and colonial legacies. The pessimistic Davis describes slums, in many ways, as lost causes. They are products of an excess surplus of labourers driven out of the rural countryside in search of better lives, only to find themselves living in poorly built, unhygienic, derelict squatter settlements. Slum clearance only leads to the displacement of millions of poor dwellers who are evicted by governments and private estate developers whom have determined that their neighborhoods are slums filled with crime, disease, filth and poverty. "Slumdom" is the result of systems of self-interest and ‘First World’ selfishness linked to economic adjustment policies, globalization, capitalism and colonial legacies. Davis sees no economic potential in slums. He dissents with Herman De Soto’s argument that the formal recognition of land ownership for slum dwellers will fuel a cycle of improvement as dwellers can now secure loans based on property ownership, arguing that doing so will only increase division between “owners” and “non-owners,” and add to the issues of taxation, exploitation, and inequality, such is already the case in Mexico City. In essence, Davis blames neoliberalism for these problems. The ‘villains’, or driving forces behind modern slum creation, are the World Bank and the IMF. And Structural Adjustment Programmes (SAPs) – conditions attached to provisional loans that poor countries are subjected to whereby neoliberal market policies (opening up of the market, removing trade barriers and excess state control) are promoted – have been the reason. By encouraging less trade subsidies and privatization, SAPs lead to borrowers having to cut back on public taxation and spending. Davis states that millions were pushed to the informal sector or into low paying, low-skilled jobs with “miserable salaries” and poor working conditions. Meanwhile, SAPs are also to blame for decreased agricultural subsidies ad removal of local self-sufficiency in agriculture by forcing import trade and undermined the economies in cities such as Lagos by exposing the markets to new competition. All this is exacerbated by meddling politicians, tyrannical slumlords, natural disasters, falling prices, inflation and exploitation- even the poor exploits the poorer. Capitalism and neoliberalism hence fail to deliver their promise to the poorest populations, which are forced to live in degraded, derelict and virtually unlivable land. According to Davis, war, terror, fear and destruction are the inevitable outcomes of ever-increasing global slumdom; the “slum bomb” is waiting to explode and wreak havoc amongst global nation states. Stylistically, Davis does a brilliant job with dramatizing the conditions of urban slums in developing world cities and makes an outstanding contribution in this respect. The book’s rapid, powerful machine-gun styled prose is fast paced, readable, and concise. Structurally, the chapters follow a semi-chronological order that transgress the main thesis, increasing in scope (from the introduction and a global overview to detailed, specific SAP impacts) as the chapters flow on. Without a doubt, Planet of Slums is a well- researched and academic book, but at times can be repetitive in emphasizing the downfalls of SAPs and the failures of neoliberal policies. The book, in particular chapters, is seemingly a bombardment of facts and merely a carefully screened reproduction of parts of the UN’s Challenges of Slums report studded with more aggravated examples. Planet of Slums is not a happy read. Davis uses an explicit Marxist framework in his exploration of slums, describing the current situation of ‘mega-slums’ whose inhabitants are largely outside the global systems of economic production and the implications of this for class struggle and violence. Marx put forward that economic interests created by markets in any given society creates a situation of "haves" (the advantaged upper class) and "have-nots" (the disadvantaged lower class), and those in an advantageous position will do what they can to preserve their upper hand. Marxism regarded conflict and war propelled by the dissatisfaction of the lower class as the engine of social change. Furthermore, the book has its foundations an article published by Davis with the same name under the New Left Review in 2004, which briefed the parameters of the future histories of large world cities in the developing world, outlining the challenges of urbanism faced by the informal proletariat in cities that will absorb all the future world population growth. Understanding Davis’s theoretical approach, even if merely constituting background information, is useful when reading Planet of Slums as he is severely critical of the various attempts to improve the millions of slum-dwellers in the Third World. As he outlines one possible solution after another, each is deemed to be fundamentally flawed at best or a regressive failure at worst (Lever, 2008). The primary inspiration and source of ideas for the book is UN-HABITAT’s report titled “Challenge of Slums” (Slums, 2003). It detailed the latest scholarship and data from over thirty years of involvement with research in slums. The paper estimated that there are around one billion people who are living in slums around the world and emphasized the need for urgent worldwide effort for reduction of urban poverty to prevent further slum growth (UN-HABITAT 2003). Davis praised the report for ‘breaking with traditional UN circumspection and self-censorship to squarely indict neoliberalism’. The book effectively utilizes the report as a backbone of facts and research for his chapters on the urban sanitation crisis, slum ecology, sustainable urbanism problems and the informal employment sector; the solid framework facilitates the book in offering more detail and insight on the different ‘case studies’ of urban slums in the Third World all set against a compelling backdrop of neoliberalism, exploitation of the poor, and the deadly effects of the ‘sapping’ of growth due to IMF policies. Amongst these factors, some of the most outstanding and compelling analysis in Planet of Slums is in chapters where the pivotal role of the postcolonial state in influencing struggles of the poor, the adoption of racial zones, specialised spaces and division of land are linked back to the colonial era (‘The Treason of State’, Chapter 3; Haussmann in the tropics’, Chapter 5). Davis mentions the “broken promises of state formation” and describes how the postcolonial nation “comprehensively betrayed its original promises to the urban poor by reneging upon historic state commitments to relieve poverty and homelessness” (p. 69). According to the author, the rich postcolonial elites choose to reproduce the ‘physical footprints’ of segregated colonial cities (Morton, 2008) and rapidly adapted the racial zoning of the colonial era to ‘defend their own class privileges and spatial exclusivity’. In other words, urban spatial zoning, resource provision and estate ownership are determined and directly dependent on power struggles – and the rich will always have the upper hand in colonial cityscapes due to historical legacies left behind by colonialist exploitation. The book’s strength comes from the diverse and in-depth historical case studies of urbanism in developing areas. Furthermore, global phenomena such as growth of urban slums, city regeneration, slum clearances and suburbanization are thoroughly sketched out with support from a plethora of references, hard-hitting statistics and accounts from sociologists, geographers, economists and scholars’ many of whom have lived and worked in slums. But it is also true that Davis’s depiction of his urban slum planet does not always seem believable. To a large degree, the conclusions of the UN’s Slums report include the same facts that Davis so powerfully presents. There is no first hand data or empirical evidence in Davis’s entire book, nor are there any representative qualitative data from a shack-dweller’s point of view. It is, as Grant (2008) notes, as if Davis has yet to set foot inside a slum. Consequently, the slum dwellers in the book are depicted as “individuals without agency, their voices are almost never heard” (Grant, 2008). In Davis’s slum planet, big actors and players such as the World Bank, IMF, governments, De Soto and the Washington Consensus are the destroyers. Slum alleviation efforts are futile; Davis sees no benefit from grassroots nongovernmental organizations working to alleviate the problem of urban slums. He notes dismissively, “for all the glowing rhetoric about democratization, self-help, social capital, and the strengthening of civil society, the actual power relations of this new NGO universe resemble nothing so much as traditional clientalism” (p. 76). Within context, however, the level of pessimism is unsurprising since the book is an explicit follow-on from the author’s earlier apocalyptic account of a slum-filled world in 2004. But such a deep level of pessimism can be difficult to accept and is a key shortfall of the book. Further, the many different examples of slum life across urban cities around the globe – in Africa, America, Asia and England – blur together like a mixed batter, blending to form an almost homogenized picture of a world of slums. This is not an entirely accurate view, as it does not consider local factors that contextualize each individual slum setting. All slums are different, and there has been no attempt to show the cultural innovations and human development of particular slums around the world. He could, for example, have mentioned the pioneering of homosexual marriage in Durban’s Cato Manor slum settlement where a large gay community was established in the 1950s, or noted that much original American music stemmed from the slum dwelling musician Woody Guthrie (Klein, 1980). The author seems to purposely gloss over the solutions and the continuing efforts of local people and their communities, governments, charities, companies, and others. The indifference to solutions can be dangerous in a book about a pressing global problem which, frankly speaking, is an issue that can be alleviated by means of improved governing, better allocation of resources, welfare schemes and more sensitive socio-economic policies. In sum, Davis’s powerful and illuminating book gives a clear overview of the state of slums in our modern world. Fact-filled, hard, fast and eloquently written, it offers a common sense critique of capitalist processes such as neoliberalism and globalization using a Marxist framework of argument. It was written as a response to the UN’s landmark Slums report, which Davis uses effectively as a platform to highlight his main argument that the ‘main single cause of increases in poverty and inequality during the 1980s and 1990s was the retreat of the state’ (Slums, 2003). It is a spine-chilling image of what the future could hold. Though some may call this depiction a stretch – of the great slums as a geopolitical volcano waiting to erupt – it is nonetheless a frightening portrait that resonates long after the last page has been turned. Angotti, T. (2006). Apocalyptic Anti-Urbanism: Mike Davis and His Planet of Slums, International Journal of Urban and Regional Research, 30 (4), 961–7. Davis, M. (2006). Planet of Slums. London: Verso. Davis, M. (2004). ‘Planet of Slums’ New Left Review 26 (March–April). Retrieved from http://newleftre- view.org/?view2496. Grant, R. (2008). A Review of “Planet of Slums, Annals of the Association of American Geographers, 99 (1), 216-219. Klein, J. (1980). Woody Guthrie: A Life. New York: Random House. Lever, W. (2008). Book Review: Planet of Slums: Mike Davis, 2007 London: Verso. 227 pp. £8.99/US$16.95 paperback, Urban Stud, 46, 1751. Lodge, T. (1983). Black Politics in South Africa since 1945. Johannesburg: Ravan Press. Morton, A. D. (2008). Planet of Slums. Capital & Class, 32 (94), 155. Pithouse, R. (2008). 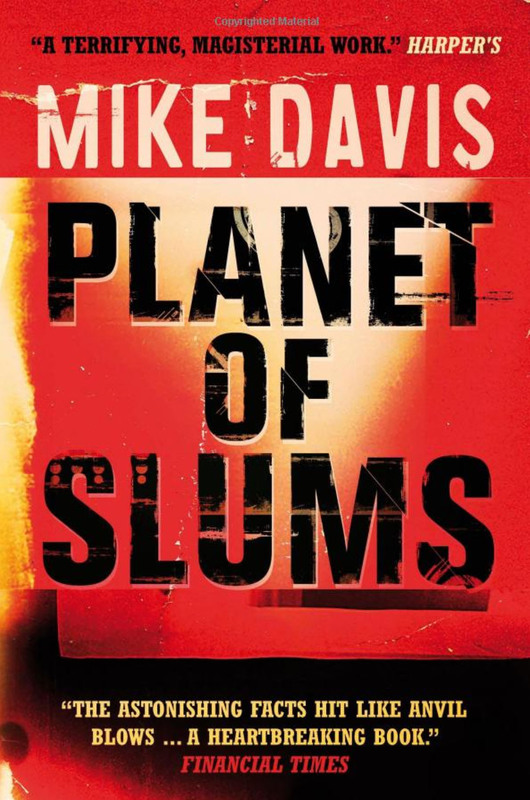 Book Review: Mike Davis (2006) Planet of Slums. London. Journal of Asian and African Studies, 43 (5), 567-574. UN-Habitat (2003). The challenge of slums: Global report on human settlements 2003. Sterling, VA: Earthscan. Florence Lee graduated in 2017 with a Bachelors degree in Law from Fitzwilliam College, University of Cambridge in Cambridge, United Kingdom. The Development Agenda After the Millenium Development Goals: Is the Post-2015 Agenda "Truly Transformative?"